Manic Street Preachers bassist Nicky Wire has launched a passionate defence of public libraries facing closure. More than 450 libraries and mobile services are believed to be under threat across the UK as local councils try to balance their budgets. Wire told The Guardian that it "seems like a direct attack on the soul of the country." The band from Blackwood famously sang that "libraries gave us power" in their hit song A Design For Life. The phrase was adapted from "Knowledge is Power", an inscription above the entrance to a former library in Newport. 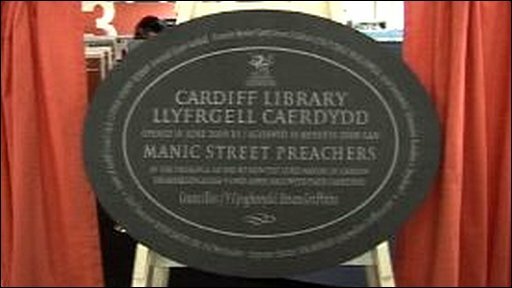 The adpated lyric is inscribed on a commemorative plaque at Cardiff's new central library, which the band officially opened in 2009. 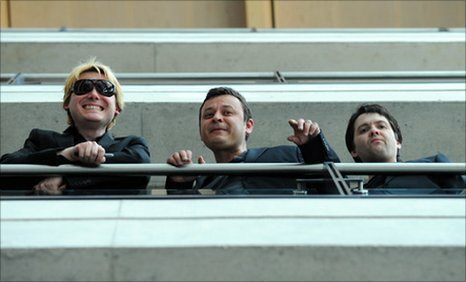 The Manic Street Preachers, whose hits include the No 1 If You Tolerate This Your Children Will Be Next, have been keen supporters of public libraries and their role in educating the working classes of south Wales. 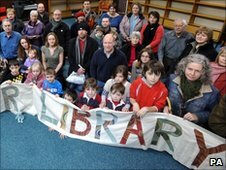 Wire's comments follow a day of protests at libraries across the UK on Saturday. At one library in south London the event turned into an all-night sit-in involving about 35 protesters. Authors Philip Pullman and Mark Haddon were among those who took part in events elsewhere. Wire told The Guardian: "So often absolutely ordinary in appearance, a good library should offer escape routes down the most extraordinary avenues, pathways into different worlds from the one you've left outside. "Ridding our villages, towns and cities of libraries, which are essential in shaping a nation's consciousness, seems like a direct attack on the soul of the country." Wire also revealed that his wife and brother had worked in libraries and that he himself found them a great help when studying for his O and A levels and "a key factor in shaping who I am today." He dismissed the idea that books were outmoded in a digital age. "Maybe I'm old-fashioned but I still believe that the core of libraries will always be printed words rather than screens or keyboards." "We need to cherish these things while they still exist. Seek solace, seek knowledge. Seek power." Councils facing having to make library cutbacks have blamed the financial squeeze on budgets and the need to protect other services, such as those for the elderly and the vulnerable. Libraries v internet - who wins?